After researching and constructing a couple of Hugelkultur growing beds for our ‘growing for the future’ project at work recently, I decided that I’d put one in on our allotment as well. It’s a good way to productively use up unwanted biomass that won’t compost easily and might otherwise sit around on a site for years before it decomposes. It helps with water retention, as decaying woody matter tends to be sponge-like, soaking up water and releasing it slowly to nearby plants. Nutrients stored in the biomass are released slowly over the 5-6 year lifetime of the mound, without the need for re-fertilisation. The system does also have its detractors – see the Wikipedia article on the subject for more details – but as I’m only trying it on a relatively small scale, I’m sure the interest of the experiment alone will outweigh any minor drawbacks. For ‘biomass’ read: pretty much any woody organic matter that you have lying around that you’re happy to bury in a mound of earth. 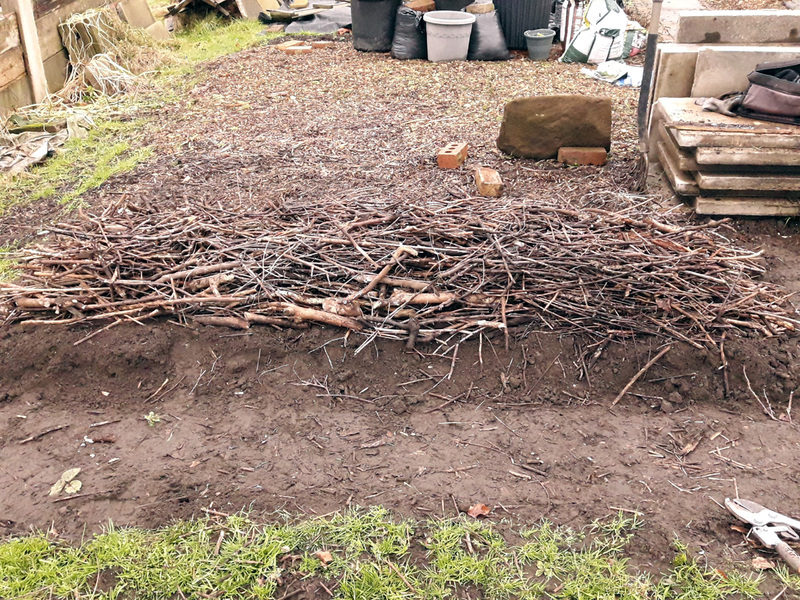 In our case, I was keen to get rid of two old wood piles that had built up at the back of the plot, consisting of four years’ worth of fruit bush, willow and other assorted clippings and cuttings. Unfortunately, they were both situated right next to my neighbour’s huge compost heap, which is sadly infested with bindweed. Said woodpiles were therefore a bindweed climbing frame for most of the year, and of minimal use for anything else, except wildlife habitat (and we’ll be addressing that with more bug hotels in due course). I also had a few branches left over from cherry tree that we removed three or four years ago, and some prunings from the overgrown plum at the back of a neighbour’s plot that I tackled for them last summer, and some old, brittle sunflower stems. All good material for Hugelkultur. The one thing I avoided using was the fresh trimmings from the willow on our plot that I coppiced right back a couple of weeks ago. That stuff sets down roots and re-grows at the slightest excuse and I didn’t want to turn the Hugelkultur bed into a willow fedge. 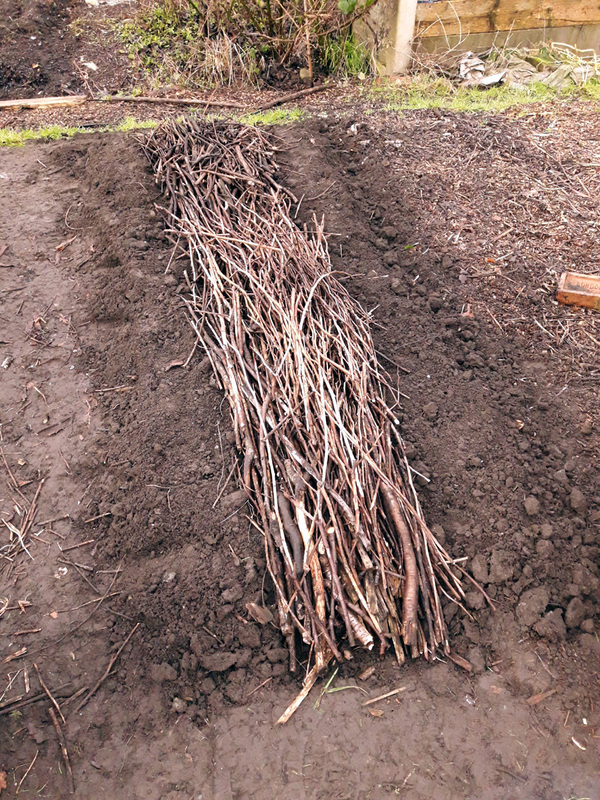 If you’d like detailed instructions on how to build a Hugelkultur bed, there are plenty to be found online, including lots of video demonstrations. Edit 12.02.19 Also, Helen – who left a very helpful comment, below, has a post on her ‘Growing Out of Chaos’ blog with some further tips and pointers. 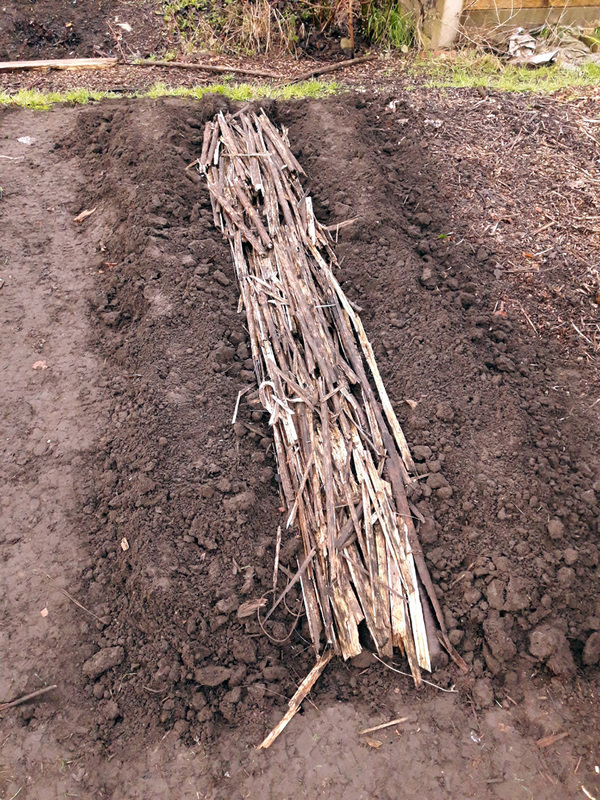 Starting with the thicker, woodier stems that will take longer to decompose, I started building up the bed in layers. 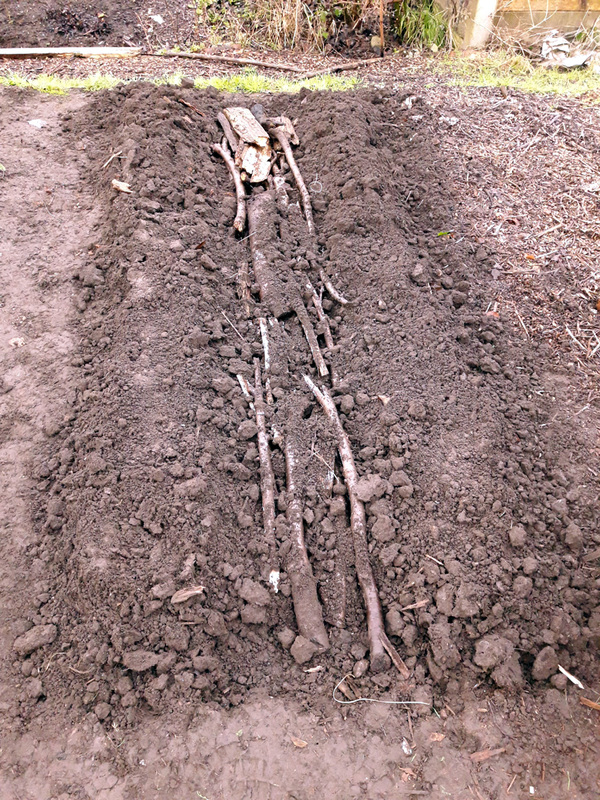 First a good layer of woody material, then a thin cover of soil. The latter is to make sure there are plenty of soil microorganisms and fungal mycelium introduced to the centre of the pile. Keep doing the above, until you’ve got a pile that you feel is high enough for your purposes, or until you run out of biomass to add to the heap. I haven’t actually completed this stage yet. Some of the wood from the bottom of the second pile was still quite dry and with persistent rain forecast towards the end of last week, I wanted to leave the top off to give it a good soaking, again, to help with the decomposition. Next week I’ll be digging out some rough, grassy turf from the centre of the plot, where I need to lay some more flags for our path, so I’ll dump that on top, inverted, and will finish off with a load of leaf-mould that’s been breaking down for a couple of years, and soil that I’m digging out of the back of the plot, where I plan to recycle some more concrete flags. 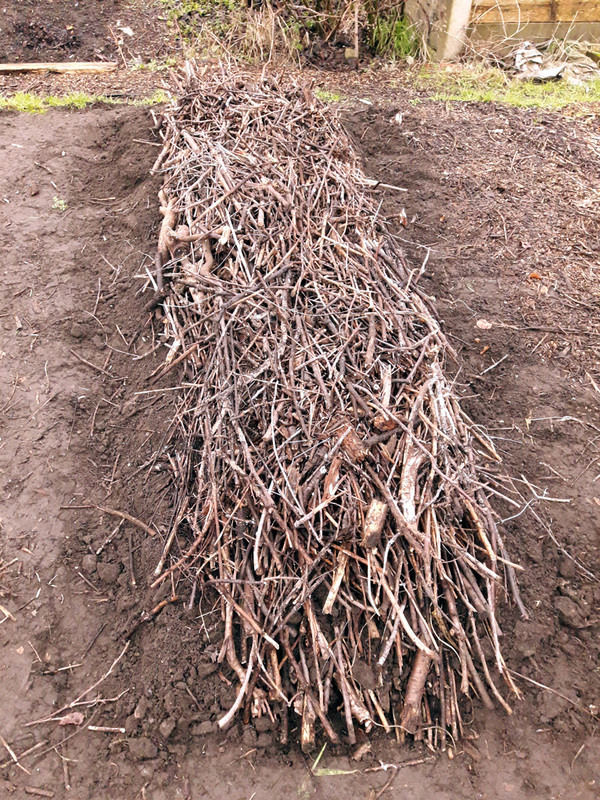 I’m expecting that the Hugelkultur bed will shift and settle as the woody material in the middle breaks down and collapses, so it’s probably not suitable for anything like a fruit bush or a tree. But annual plants should do well, planted into the outside of the mound. 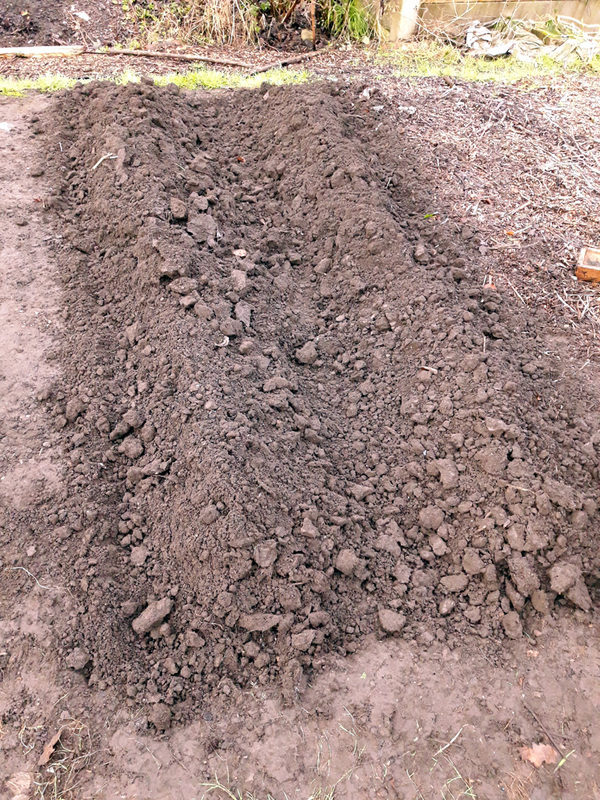 I’m planning to grow squashes in the bed this year, to see how they do. They’re quite hungry plants, so I’m hoping the mass of slow-release nutrients will feed them well through their growing season. I’ll aim to grow the same variety elsewhere on the plot in regular soil at the same time, by way of comparison. I’ll keep you posted. How about you, have you ever tried a Hugelkultur growing system? Any tips or warnings if so? Please do let me know, via the comments.